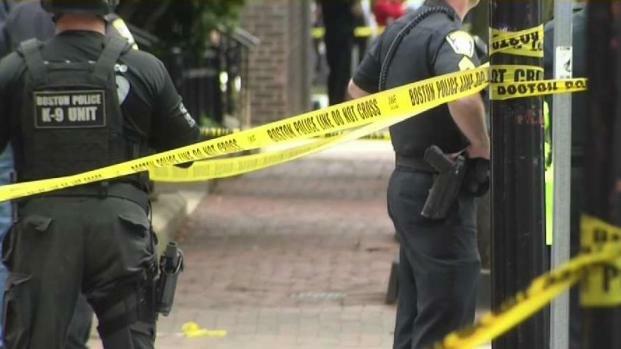 Two men have been arrested and charged in connection with the shooting of a Boston police officer Sunday afternoon. According to police, Raquon Martin, 21, of Boston and Antoine Mack, 35, of Pawtucket, Rhode Island face several charges including armed assault to murder. Both men are expected to be arraigned in Boston Municipal Court. It is unclear if either of them has an attorney. The police officer was transported to the hospital and is being treated for non-life-threatening injuries, according to Boston police. 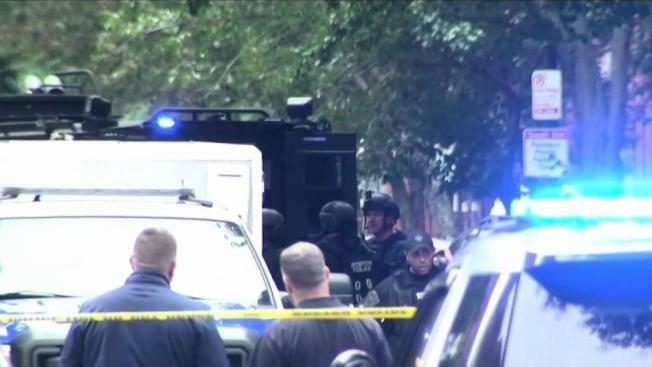 The officer was shot when on patrol in Boston's South End. He is being treated at Brigham and Women's Hospital in Boston and is expected to be okay. Neighbors and officials, however, are outraged by the incident. Police officers were patrolling in the area of 89 West Springfield Street just before 2 p.m. when they noted a group of men in their 20s holding their waistbands. 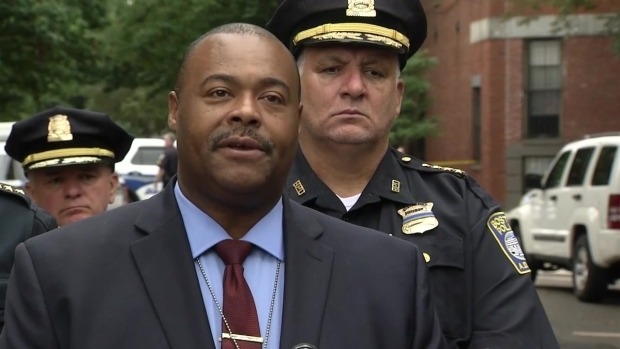 The men allegedly made eye contact with the officers and then turned around and entered the apartment building, according to Boston Police Commissioner William Gross who spoke from the scene of the shooting on Sunday. Gross says the officers suspected the men were armed with firearms. The officers attempted to enter the apartment building but the men resisted, holding the door so that the officers couldn't enter. When the officers did enter, one was shot in the calf. That officer was transported to Brigham and Women's Hospital with non-life-threatening injuries, according to Boston police. According to Gross, a suspect was then reported barricaded in an apartment, prompting police to treat the situation as a hostage situation. Officers responding to the situation placed three suspects in custody, and no shots were fired beyond the one officer getting shot. Gross says the apartment is frozen while officials wait for a search warrant. They expect to recover the firearm in the apartment. 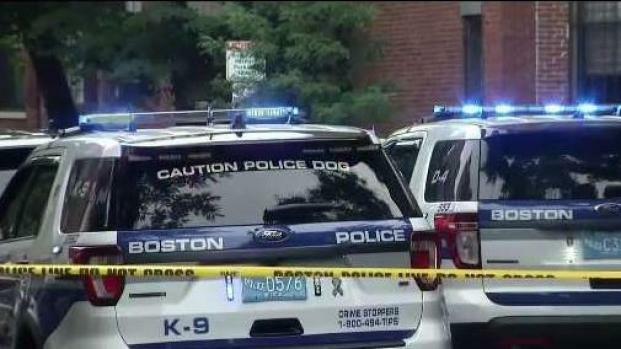 A Boston police officer was shot in the leg after responding to a report of a double-parked vehicle, police said. Those living in the neighborhood were shocked to see a scene like this. "This is a very safe neighborhood obviously and just to kind of see this happening in our neighborhood... it's pretty crazy," one neighbor said. Alaina Garry lives in the neighborhood too and was on her way to her friend's house when they heard the commotion. "We usually cut down this block and we started to turn and suddenly there was a swarm of cop cars and SWAT cars and they told us that we couldn't come down this street and that there was a hostage situation. Some sort of standoff," Garry said. Another neighbor also reacted to the severity of the situation. Boston Police Commissioner William Gross speaks about the officer-involved shooting in Boston Sunday afternoon. "Life is life. Life is precious and it's crazy that people are running around... just don't even think twice about it," Marcelo Villegas said. Mayor Marty Walsh issued a statement Sunday echoing Gross's concern with gun violence. "Our police officers work hard every day to keep our residents safe, and this senseless violence will not be tolerated." Walsh also wished the officer a speedy recovery and thanked the first responders for their swift response to the scene. This shooting comes on the heels of several other officers having been shot in New England during 2018, including the fatal shootings of Officer Sean Gannon in April, Deputy Sheriff Corporal Eugene Cole in April and Officer Michael Chesna in July and the non-fatal shootings of Officer Donald DeMiranda and Officer Ryan Moore in July.